We are experienced tree surgeons based in the midlands who cover, Derby and Derbyshire, Nottingham, Burton-on-Trent, Staffordshire and Leicestershire. We offer a quality tree surgery service with all work carried out to BS 3998 by our experienced and qualified staff. We are fully insured and can carry out large or small jobs (all with the same amount of care) leaving the site clean and tidy. 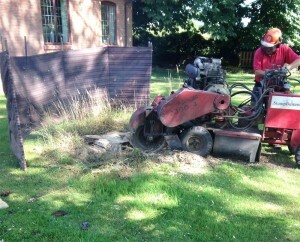 One of PJC Trees services is to grind stumps out of the the ground. You can see us at work in the photo on the right. 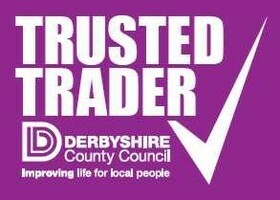 Don’t forget for all of our services you can obtain a free quote today, click here to get in touch. 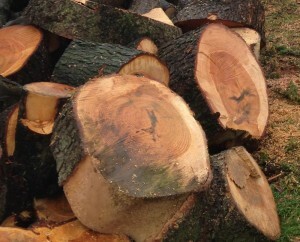 We sell logs in bulk loads either by trailer or in cubic metre bags. Also we sell split logs in small nets. Additionally, we sell woodchip mulch in small clear bags, bulk bags or by the trailer load. If you are interested please do not hesitate to contact us using the details on this page, alternatively click here. All the work was carried out very efficiently. Phil was friendly and helpful and he achieved a neat and tidy result. Great services. Fast and efficient job. 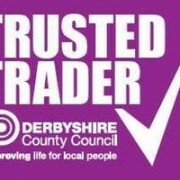 Very professional, and job done for a competitive price. Turned up on time, very tidy.